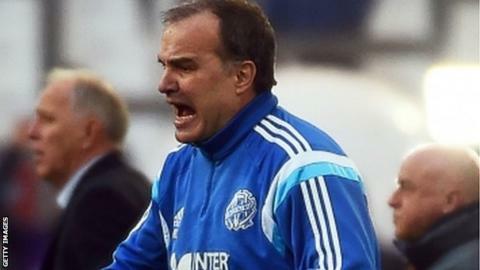 French Ligue 1 side Lille have appointed former Argentina boss Marcelo Bielsa for the 2017-18 season. Bielsa, 61, coached Marseille in 2014-15 and was also manager of Italian club Lazio in July 2016, before resigning two days later. The Argentine will replace Franck Passi, named on Wednesday as interim coach for the rest of the season. Lille last won the title in 2011 and they are currently 14th and 30 points behind leaders Monaco. Former Bolton midfielder Passi was also Biesla's assistant when he was at Marseille. During a news conference on Wednesday, the 50-year-old said: "I speak often with Marcelo, everyone knows my relationship with him. "I've chosen to be Lille coach from now until the end of the season. After that, I'll decide my future from 30 June onwards." Lille director general Marc Ingla was delighted with the appointment of Bielsa, who led Argentina to Olympic gold in 2004 and Athletic Bilbao to the final of the Europa League and Copa del Rey in 2012. "Marcelo Bielsa is without a doubt one of the most respected and influential coaches and to bring him here is an immense satisfaction and proof of the ambitions of the club," Ingla said. "Even if we are absolutely concentrated on the next games and the highly important fixtures to come before the end of the season with Franck Passi, it's good news that we have announced today for the Lille of tomorrow."